We had a whirlwind of a weekend! I will attempt to recap, mostly in pictures* because I am tired...and really, they say it all. On Saturday morning, after my running club meeting (sneak preview: I loved it!) we hopped in the car (ok, I showered first) and drove 3 1/2 hours north to pick up our boys, and then drove another 4 hours east. Destination? Shreveport, Louisiana - home of casinos. 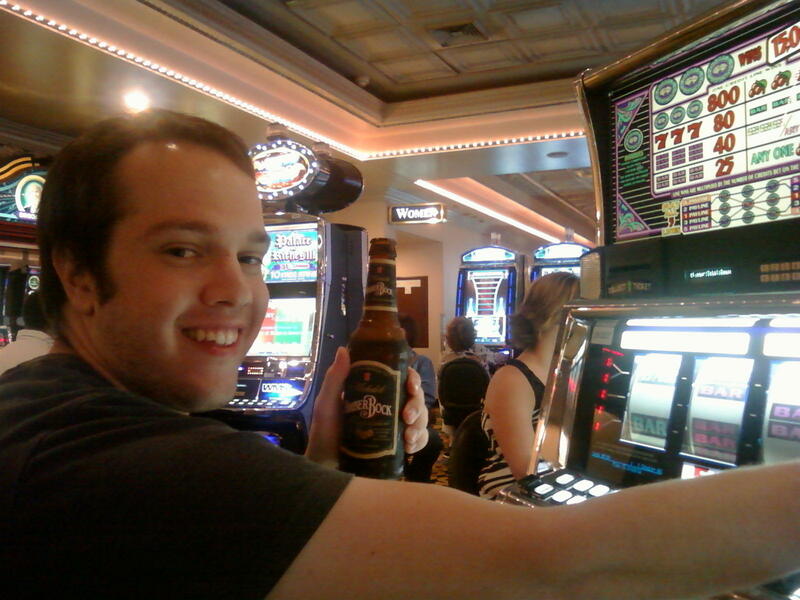 Our youngest son, Max, turned 21 last weekend, and Jeff has been itching to take the boys gambling. Since Las Vegas was not only a little (read: a lot) out of our budget, but also too far away considering that the boys have school on Monday, Shreveport was our destination. First things first - our traditional stop at the Starbucks in Waco. I fueled up with a grande black coffee and a black cherry parfait, which was the perfect lunch, at only 310 calories. Yum. 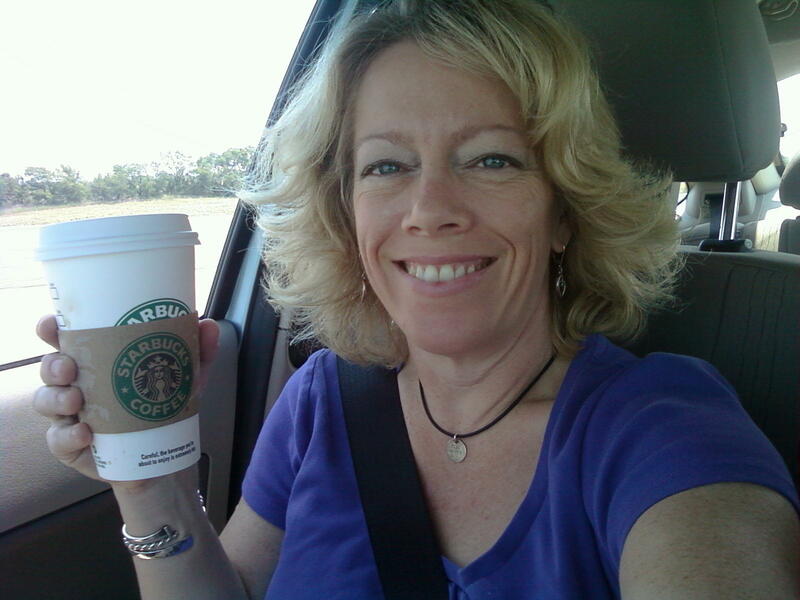 Love me some Starbucks coffee! Now, whenever I go on a road trip, I think of food...this goes back to the days when Jeff and I traveled from our home in southern California to visit my parents in northern California...food was a huge distraction on that seven hour drive...mostly strawberry milkshakes from Jack in the Box and candy bought at the gas stations. As I knew I would get into that mindset, I preempted my potential horrible choices with some not-so-awful-yet-still-indulgent-snacks like a bag of pretzel sticks, a jar of dry-roasted peanuts, some beef jerky, um...red Twizzlers, some raspberry gummy candy - oh, and some Mentos. I shared, of course...it was fun and bad and good - and as I never do things like this anymore, I really didn't feel too guilty about it. We drove and drove and drove...man, no matter which direction you go, it just takes a long time to get out of Texas! 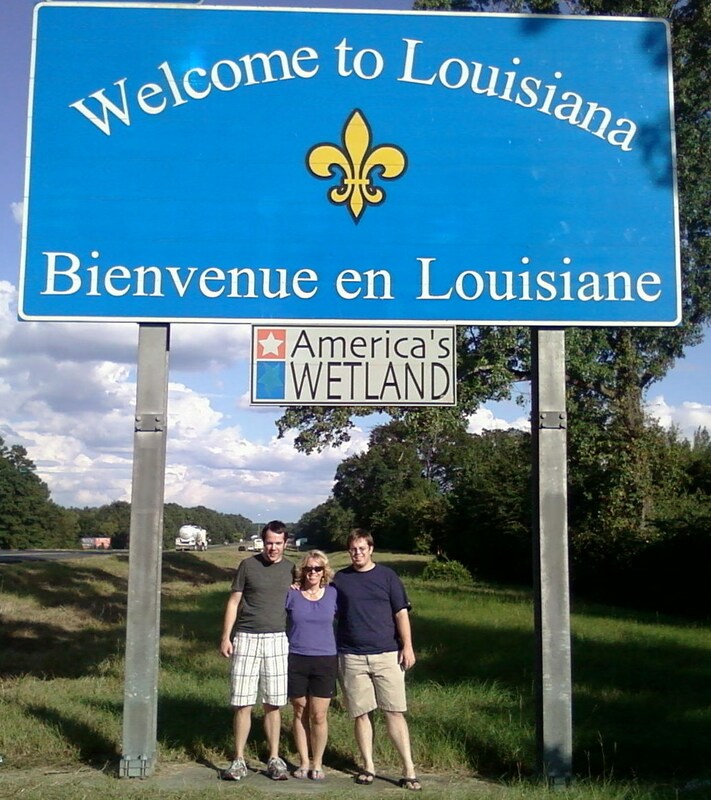 Finally we made it to Louisiana - the bilingual state! 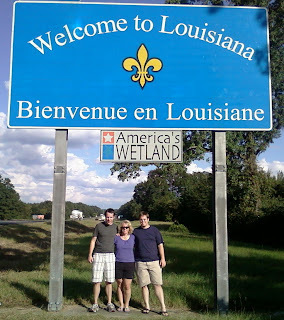 Yes, we were the dorks who pulled over to pose under the sign! We quickly checked into our hotel room (free, thanks to Jeff's frequent traveler status at La Quinta) and hit the Horseshoe casino. It was interesting - they ID you as you enter the casino. Fine - I got in line. Then the bouncer-guy waved me through...sigh. Guess I don't look as young as I feel, lol! 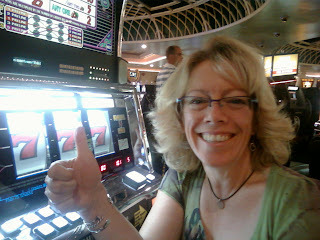 We tried the nickel slots first, where I quickly won my first jackpot! Looks impressive, no? I think the payout was something like $4, haha! Then Max discovered that they will bring you drinks FOR FREE - he ordered a beer. Corrupting my newly-legal son with gambling and alcohol! As we didn't really bring very much money to blow, we were pretty conservative - just had fun mostly with the nickel and quarter slots, although Sam tried his luck at the dollar slots and won a $40 jackpot! After a while, we left the casino in hunt for a late dinner - it was dark, we didn't know our way around and ended up at Posados in Bossier City, which advertised itself with a huge neon sign that said "Fine Mexican Food." It was not. I hate putting sub-par food into my mouth, but it was late and we were hungry. Oh well. Back to the casinos for a couple more hours, where I have to note that blergh, being around all of that second-hand smoke was gross. I still can't figure out how that combination added up to $500, but you KNOW I'm not complaining!!! The funny thing is that all night long, every time someone would win big, I kept saying "You're going to buy me a netbook with those winnings, right?" - well guess what? I am finally going to get myself a netbook!!! Wow. I have never, ever, ever won anything remotely like that...what a thrilling end to the evening! The next morning, we hit up the Starbucks in Bossier City for breakfast before hitting the road. My boys (Sam on the left, Max on the right) with their carmel mocha fraps - as Max said, a "pinky-out" type of frou-frou drink! Sam doing what we all did for most of this trip - laughing! We have a good time when we all get together! One of the best parts of this trip was being able to spend so much time with the boys. I hadn't seen them since May, and recently realized that they started back to school on Thursday with absolutely no help from me. No buying of school supplies or clothes, no nagging asking about classes registered, no reminding about ordering books...nothing. And you know what? They did just fine. Sniff. They are independent adults, which I know as a parent, this is what we all strive for, but still...between them not coming home at all during the summer, and now this - it was a bit of a shock how suddenly I was done with that part of parenting. So this was a nice bonding trip - yes, I think we spent most of our time together in the car, but it was great fun. And now I need a nap. And to wash my stinky cigarette-smelling clothes. Oh, and to order my netbook - woohoo! I adore that with all you did and experienced it was the time spent with your BOYS that you enjoyed the most. and I had no clue about the casinos and photos either. I love that you thought of Biz when choosing the Tabasco slot machine! Biz brought you good luck LOL! Congrats on your winnings. And I would recommend an Asus netbook...they have the best ratings the last time I checked! What a great awesome weekend you had! I loved reading about it and living through you! Congrats on your winnings and how well your boys have turned out. "Shelley's riding the sin wagon!" What a fun time with your boys! While I am not much on gambling, but $500 - yay! I do love the whole road trip aspect of it, especially with kids, even adult ones. I had no idea about the pictures, either. Live and learn. I bet we crossed paths in Denton yesterday. When I went to Las Vegas, I had my camera, and they just scoffed and said "Oh - that person has special needs!" I guess like the Rainman. I was wearing those big clothes and had the camera around my neck on a string. Go figure! Winner winner chicken dinner! 500 bucks is a nice reward for exercising your arm on the slots...or did you press the buttons for speed? Enjoy that netbook...your luck earned it. You're tiny standing in between your big boys :) You have some great boys Shelley, you must be one proud Mommy! Congrats on the win, that's a huge win and you go buy that netbook for yourself! You deserve it. Happy to hear you had such a great weekend with Jeff and the boys. And I look forward to your next post about your running group. Your comment about the sub-par food... I've got thoughts on that. I once heard that if you start to eat something that is not a "10", you should just stop eating it. Don't waste your calories. So true. whoooo hooo on the win! enjoy the netbook! How fun! You had me guessing a little bit last night--did they have some kind of jackpot at the running club??? That makes ME want to run LOL! But I kind of figured it was a trip with the boys and might have been slots. That is really a big jackpot, though. Have you thought about an I Pad? I heard they are down to $550. I just love your family. :) You guys are so cute. What a great weekend! Glad you had fun. I can't wait to hear more about your running club. Yay!!! How cool is that and good for you to get yourself the netbook! You are gonna LOVE it! Debauchery for sure! I'm glad you so enjoy your family and your boys. What a treat! I'm thinking the money was just icing on the cake. Woot! So glad that I was your spicy good luck charm!! Glad you had such a fun weekend with the boys and Jeff. Sounds like a fantastic family time/weekend. I remember how road-trips were food trips. And did you not know that the larger the neon sign,the worse the food is?? You will be joining me in bed with your netbook and me with my laptop! How awesome! I love that you are having fun with your "men" folk, and feel your pangs with them being menfolk. It sounds like a great trip that you will all remember forever! Congrats on your winnings. I totally get the food for travelling thing. We are just like that around here! Can't wait to hear how you like the netbook as I've been considering getting one. In the interest of trying to get you to come visit me, I just want you to know I live within 20 minutes of two, great big Indian casinos, one of which is the largest casino in the world. I'm just saying. Congrats on the big win! Sounds like a great weekend! I can't wait till my girls turn 21, but then again I can cause I hate the cigarette smell too. Next time you go to Shreveport/Bossier City and are looking for mexican food try Nicky's in Bossier City on Airline Drive. We used to live down there and it was our favorite. Catching up on old posts in my web browser. :) You guys looked like you had so much fun! Congratulations, winner. 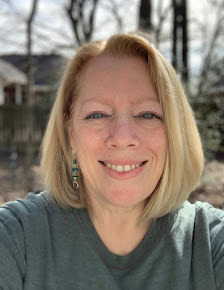 I love hearing from you and read each and every comment! Comments on older posts are moderated, so they won't show up right away - sorry to my real readers, but spammers love to hit old posts, so this is necessary. BFF Miracle Body Buffer - use code JOURNEY15 for a 15% discount! All content belongs to My Journey to Fit and may NOT be reproduced without written permission. In other words, please don't steal my writing or pictures. Site design by Riss Blog Design. Powered by Blogger.